Dentistry: Our comprehensive dental services include teeth cleaning and polishing, digital dental radiology, tooth extractions and minor oral surgery. Permanent identification: We offer microchip implantation for identification. Pharmacy: We maintain a complete inventory of pharmaceuticals, vitamins, shampoos, flea and tick control products and heartworm preventatives to meet the needs of your pet. We also carry a full line of prescription diets. 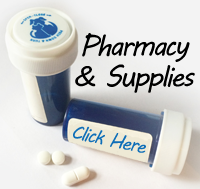 We also offer an on-line pharmacy through a link on our home page.